Details: One Bedroom, Two Bath beachfront home, sleeps up to 6 people. Panama City Beach Florida Vacation Rental Home at Splash Condominium. This 1 BR condo at Splash in Panama City Beach Florida overlooks the white-sand beaches of the Gulf of Mexico – 1 BR/2 BA resort home with a king-size bed plus bunk-beds and a sleeper sofa, the property can sleeps 4 to 6 people comfortable. 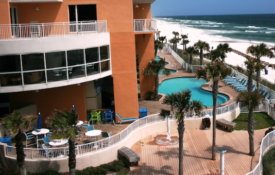 Splash condominium is located on the West end of Panama City Beach, convenient to Pier Park, where you’ll find an array of popular dining, entertainment & shopping options such as Margaritaville, Guy Harvey’s, Back Porch Seafood, Ron Jon Surf shop & more. Situated on 400-plus feet of white-sand beaches, Splash community amenities are among the best on the Gulf Coast, including two family-fun water-parks, dive-in movies in the summer, a lazy-river, hot tub, an outdoor pool, game room, a seasonal poolside bar & grill…all for you enjoyment.